Nah, kidding. I’m having a great time and am going to continue doing this. Just winding you up. No, I’m not. I hope you read the entirety of the opening bit, Dr. Cooper. It was just my little joke. (USA Rugby’s AR course is) an on-line course now, given once a month. I teach it about every-other iteration. Sign up on USARugby.org. It’s limited to 10 students, and is $30. It is a prerequisite to have had the Level One Referee Course and the Touch Judge Course. Go to USARugby.org , click on REF, click on Courses and then you’ll see the sign-up page. The AR course does not teach the duties of the 4, 5, and 6, however. There is no formal course for teaching those duties, although Bruce Carter and I have held a clinic to teach those duties; it takes about an hour, at most. Berkeley played its last match of the season on a field they had used before the Otis Spunkmeyer Field. It was an oasis between the Oakland Airport & Alameda with views of the Colliseum & estuaries around the bay. Tight 1st half with Baracus barely winning 7-5. They were the only team to score in the 2nd half. Pretty clean play by both teams who obviously respected each other. San Jose started the game very strong by scoring a try in the first 3 minutes of the game. Berkeley scored 3 tries during the first half to lead 17-7 at the break. The second half started like the first one, with a strong San Jose team. They scored a try at the 5th minute of the half. The game was very balanced until the 60th minute, and then the All Blues started to score tries. They scored 5 unanswered tries in the last 20 minutes. Special congratulations to the San Jose #8 captain who has an excellent understanding of the game and who poached more balls in one game than any other player in our area, at any level. I believe she successfully poached 5 balls, and obtained 4 penalties for holding on to the ball which resulted in a yellow card for the other team. Navy gave Cal a very thorough 55 minutes of competition but couldn’t match the home team for power, pace, skill and endurance. Cal’s main issue was that they gave away too many penalties early (a ratio of 6-1 at one point) and with a dangerous tackle on their own goal line, they also found themselves down to 14 after 25 minutes. It was 16-10 just after the break, but then Cal turned on the afterburners and pulled ahead. Pack-leader Alec Gletzer was clearly the best player on the field but there was a lot of talent on the filed as a whole. The Varsity Cup final should be excellent. My primary assignment for the weekend took me to the MIT campus in Cambridge, MA. MIT, being made up of mostly grad students, plays in the men’s club league as opposed to the college divisions. Therefore they also welcome non-MIT students into the mix. This makes for a slightly more stable club than a traditional grad school team. Good for them as they were seeded 1st in the D3 playoffs. Saturday was a beautiful spring day for a drive, until we hit Boston traffic. Being the Saturday before the Boston Marathon (which just kicked off as I’m writing this) the traffic was madness. It took Colleen and I nearly a half-hour to go 1.5 miles up Mass Ave. So I made it to Briggs Field 30 minutes prior to kickoff. Both teams were well into warmups as I arrived. Kickoff was right on time at 12pm. The match was a bruising affair with one yellow on each side. The first was awarded to MIT. 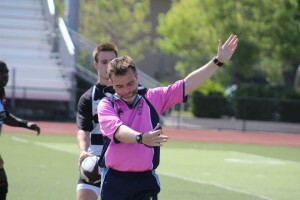 At a penalty about 7m from in-goal the MIT flyhalf took a quick tap beyond the mark, so I blew my whistle to stop him. He made it to in-goal, where a NS player made a tackle, both not quite aware of the stoppage. That’s fine, no one else on NS was taking part. A MIT player took offense to this and charged into in-goal to save his flyhalf from a very safe tackle. So, you can’t control yourself, off you go. After an understandable dustup between the teams I spoke with the captains about the incident, that it was over and let’s get on with rugby. I let them cool for a minute and talk to their teams. All is well, right? Not two minutes later a NS player late hits the MIT scrumhalf at a line out. Fine, off you go, too. After that, we did finally get back to playing rugby. MIT was able to find the open slots for more tries, otherwise this was a pretty even match. Good luck to them in the final. Location: Irish Cultural Center, Canton, MA. EDITOR’S NOTE: The press officer is suffering from early season mistakes as well. I looked for the final score in the press release and couldn’t find it. Amateurs. A glorious day for rugby, and two teams that knew each other well played the last game of the regular season in good spirits. One of the better kicking performances I’ve seen, with Chico 5/5 on conversions, and the Vacaville starting #10 going 11/11 before taking a seat on the sideline. The subsequent Vacaville kickers were less successful, going 1/3. Fun day out. Hot day in Colusa. Definitely over 80, forecast for 90. South Valley had 5 players broke down on Hwy 505, so we waited until 1:10 for kick-off (their players never made it to the game). In the 2nd minute of the game, Colusa muscled one in with good work from their forwards. 4 minutes later, their flyhalf/captain, Cody Beckley lofted a kick to their wing who picked it up on the full and was gone. The next two Colusa tries were scrum downs that they just pushed right to the goal and scored. Colusa was up 41-5 at the half as they dominated possession throughout the game. The second half was a little more balanced as Colusa subbed, 24-12 in the second half. South Valley ended on an up note; with no time left, their captain and number nine Anthony Guidry stole the ball and beat everyone to the post for a center try (the son of my former team mate, Matt Guidry). Good attitudes be all were displayed and the large crown created a festive, playoff atmosphere. Sunny 75F at the Stanford/Palo Alto community playing fields (turf). Both teams were structured and tactical on offense, but generally disorganized in defense, which resulted in lots of back-and-forth scoring. EPA imposed their physicality to lead 26-12 at half and 48-24 midway through the 2nd half, before Fresno stormed back to within 48-38 with 12 minutes remaining. EPA then sealed the game with 2 converted tries to win the contest, 10 tries to 6. Entertaining rugby match that went back and forth with several lead changes. Reno got a late try to take the lead and then added another in the closing minutes to seal the victory. Kudos to both teams. A hot, firm turf football field, more lines on the pitch than could easily be kept straight in anyone’s head, four lead changes, and the match decided at the very last moment. What a great game, and a fantastic way to spend the afternoon in San Jose. The Seahawks scored and converted early following offside indiscipline from the Lions, but he Lions struck back with a brace of tries in the 13th and 16th minutes to lead 14 to 7. After much scoreless back and forth for the remainder of the half, the Seahawks tied it up just before the break. The Lions went back in front in the third minute of the second half, and the Seahawks scored eight minutes later to pull the Lions back to within two. A few minutes later, a Sacramento player went into the side of tackle and conceded the penalty, which San Jose banged over for the lead. 22-21 Seahawks with 25 minutes to play. The Lions got back in front with a converted try in the 61st minute, but the determined Seahawks dug deep, kept coming forward, and scored out wide on the left after sustained pressure on both wings. The conversion drifted wide, so with seven minutes to go it’s still Lions by one point. San Jose fought valiantly back up the field, as Sacramento defended ferociously, but when the defenders conceded a penalty, the Seahawks had a chance to take the game with a long range penalty. The kick missed, was gathered by a Sacramento player in the in goal, and run up the field as the clock ticked down. In the subsequent passage of play, a desperate Lion played the ball on the ground at a breakdown, and with time expired Seahawks had one last attempt on goal. Could there be yet more drama? With the Seahawk touchline screaming “Backs chase!” the tee was brought out, and the ball sailed towards the right of the posts. Somehow, it hit the right post and bounced into in goal, where one of the aforementioned Seahawk backs caught it above his head, despite the close attentions of the Lions defenders, but he couldn’t ground it before crossing the dead ball line. The Seahawks missed out on a fairy tale win by the narrowest of margins and Sacramento escaped back up I-80 with the win. Thanks to both teams for a cracking match. Full teams, twenty minute halves. As usual at Treasure Island there was a strong breeze blowing mainly north to south and on winning the toss the Santa Rosa captain decided to have the wind as his friend in the first half!! Santa Rosa used the wind to gain field position early and with a noticeably stronger scrum opted for scrums rather than kicking for goal or touch on two early penalties and were rewarded with a pushover try on 4 minutes. The strong breeze beat the kicker so 0-5. Santa Rosa continued to dominate territory but possession was more 50-50. SFGG put some good possession plays together to build out of defense but, as with Santa Rosa, the wind often impacted backline handling and scrums were fairly frequent. Santa Rosa had the upper hand on these scrums and eventually this pressure lead to a successful penalty kick on 22 mins for a 0-8 lead. As the half wore on SFGG started to get more of a foothold in the Santa Rosa half and put on some sustained field position pressure. On 30 mins, SFGG held up a maul well inside the Santa Rosa 22. In their efforts to avoid conceding a scrum turnover the defense split from the maul leaving an on-side SFGG player to step through and make a strong tackle and turnover which was driven over the line for a score. A narrow miss into the wind left the score at 5-8 on 31 mins. SFGG continued to dominate the remainder of the half. On 37 mins having failed to score from an advantage SFGG opted to kick at goal from 20m in line with the left post. Going for power into the wind the kicker drilled the ball narrowly wide on the left. From the drop-out Santa Rosa kicked out on the full and SFGG retained pressure inside the 22m for the remaining 3 minutes. Santa Rosa defended well and with the last play of the half the SFGG fly half spotted his right winger free wide out and cross kicked to the corner but as rugby balls do, as the winger was running in to gather, the last bounced kicked away from him and into touch. 5-8 at half time in a keenly contested first half with the game all to play for. Santa Rosa started well into the breeze in the second half and on 43 mins kicked a good penalty to stretch the lead to 5-11. The closeness of the score and the frequent scrums heightened the tension of the game and the vocal levels of the players rose significantly. A few quiet instructions for individuals to calm down were required which allowed the competitive nature of the game to be maintained without incident. In addition, the game was played at a fast pace so errors crept in as players tired. SFGG started to break into the Santa Rosa half on a more regular basis but a combination of good defense and attacking infringements to try to maintain secure ball allowed Santa Rosa to repel all attacks. On 13:23 minutes the SFGG scrum half was sin-binned as his team executed a number of offside infringements in quick succession to slow and stop Santa Rosa attacking ball. Opting for a number of scrums in a row, the Santa Rosa captain and No 8 peeled off the back and ran in from 15 yards untouched to score (unconverted) for 5-16. SFGG survived the rest of the sin bin time without conceding and put in a strong effort for the last 15 minutes which Santa Rosa continued to repel. The efforts being put in by both sides raised the temperature on the field and a quick chat with both captains was necessary to calm things down. The remaining 8 minutes was played out between half way and the Santa Rosa 22 as SFGG pushed for another score but Santa Rosa continued to defend effectively across the field. The game finished with Santa Rosa driving an SFGG attack into touch on the 22 with the final score of 5-16 in favour of Santa Rosa. A note of recognition to both hookers for some excellent line-out throwing throughout the game in the windy conditions!!! This entry was posted in News on April 23, 2015 by James Hinkin.